TSNPDCL Recruitment 2018 – Apply Online for Junior Lineman Posts: Northern Power Distribution Company of Telangana Limited (TSNPDCL) has advertised a notification for the recruitment of 2553 posts of Junior Lineman vacancies. Eligible candidates can apply online from 21-02-2018 to 19-03-2018. Other details like age limit, educational qualification, selection process & how to apply for TSNPDCL Jobs are given below. 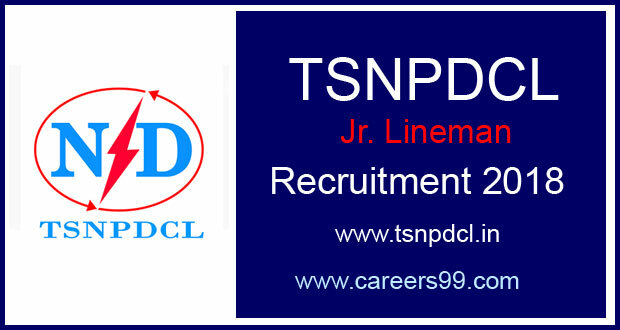 Interested candidates those want to apply for TSNPDCL Junior Lineman posts must having following educational qualifications. as on 01.01.2018 (Min. – Max.) 18 yrs. – 35 yrs. (Remittance of fee) : Each applicant must pay Rs.100/- (RUPEES ONE HUNDRED ONLY) towards Online Application Processing Fee. This apart, the applicants have to pay Rs.120/- (RUPEES ONE HUNDRED AND TWENTY ONLY) towards Examination Fee. However, the Applicants belonging to SC/ST/BC Communities are exempted from payment of examination fee. After payment of Fee, the Candidate has to visit the website http://tsnpdcl.cgg.gov.in to view the detailed notification, User Guide and Application Form. The applicants have to provide payment details (journal number and date) and upload the scanned copy of passport size photograph with signature (see instructions for scanning and uploading photograph with signature) and then invariably fill all the relevant fields in the Application. Immediately on submission of application, applicant will get an acknowledgement in the form of a downloadable pdf document. First of all, Open Official Website i.e., tsnpdcl.cgg.gov.in or Below Mentioned link from www.careers99.com Website.